Janine Davis is an administrator in the human resources department at Caltech, a job which has brought her into contact with Sheldon, Leonard, Howard and Raj. 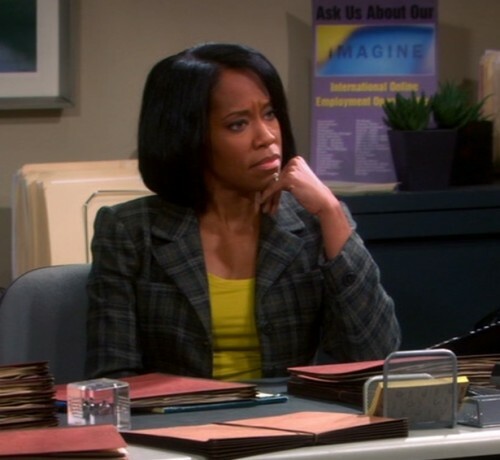 Mrs. Davis first appeared in the sixth season episode, “The Egg Salad Equivalency”, when Sheldon’s assistant Alex reported him to the HR department because of his inappropriate comments towards her. When Sheldon had his meeting with Mrs. Davis, he managed to again use inappropriate language in the workplace. Feeling he was being unfairly singled out, Sheldon threw his friends under the bus by mentioning Leonard, Howard and Raj and their own infractions. When they were all called to see Mrs. Davis, it was clear she was already familiar with Howard. “The Tenure Turbulence”: When a tenured professor at the university, Professor Tupperman, passed away, Sheldon, Leonard and Raj competed for his position. As a member of the tenure committee, the guys worked hard to win over Janine, much to her annoyance. “The Hofstadter Insufficiency”: Soon after Raj was able to speak to women, he attended a social event at the university where Mrs. Davis was also a guest. Raj’s attempts to comfort Mrs. Davis, whose husband had recently left her, did not go over well. Later, Raj and Mrs. Davis had a pleasant conversation, after Raj made it clear he wasn’t trying to hit on her. “The Junior Professor Solution”: After Sheldon returned from his cross-country train journey, in part motivated by his frustration at the university’s decision to not let him change his field of study, Mrs. Davis called Sheldon to her office. She told him the university had found a solution to his problem: he could change his field of study so long as he became a junior professor, requiring him to teach a class. “The Retraction Reaction”: After Leonard gave a downbeat radio interview on the state of physics research, Mrs. Davis called him into her office to scold him for hurting their fundraising. Later, Mrs. Davis wanted to see Leonard again after he sent her an inappropriate email while drunk. Her husband, who left her for an undergraduate student, was called Tom. Howard asked Janine how Tom and the kids were, suggesting she had at least two children with him.